We have two Xbox consoles in our house connected via WiFi, one in the living room with the router and one in my sons room upstairs. The one upstairs constantly disconnects whereas the living room one never does. 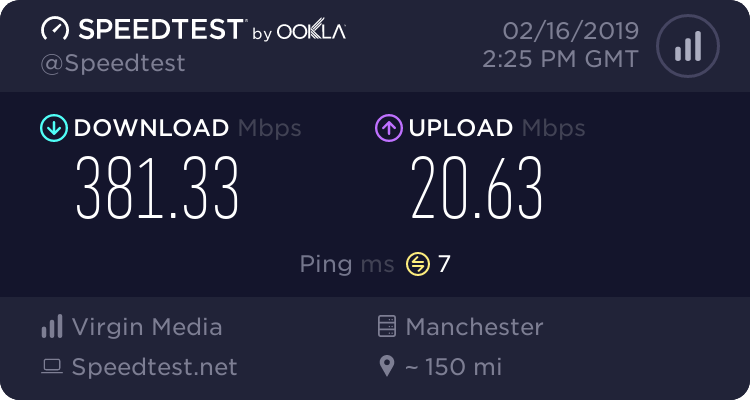 I’ve checked WiFi speed in his room and it seems fine ( about 20-30 mb) so no idea why it keeps disconnecting - can anyone help? I’m not great with this kind of thing unfortunately. Might be worth mentioning I swapped the consoles and still the same so it’s not that! Sounds like the WiFi channels are automatically switching to avoid interference, dropping the connection for approximately 30 seconds. More than enough to cause a game to disconnect. Wireless can also easily be disrupted by a number of external factors (Thickness of walls and building materials used within them, mirrors, fish tanks, cordless phones, baby monitors, microwave ovens, a neighbour's wireless router, etc.). Hi, have exactly the same problem - x box one S downstairs in back room is fine, room immediately above with x box one has lag. Don't think it's a software issue between new/old x boxes causing problem. Mainly shows up on Fortnite. No problems with other devices, mac, iPads etc. I followed the link from Static above but I have Super Hub 2 - can't find it in the menu to disable. Maybe it's Hub 3 only for that? Already using power line type adapters but some here recommending them, others saying get rid of them! Both are wifi connected only. Hope that's enough info for someone to give me some guidance. Paying over £60 a month for a son who wants me dead if i don't get it sorted. Toying with the idea of getting a wired connection from front to back of house but no guarantee that will fix it. Otherwise, getting another internet provider - installation to back of house with 2 wired connections for x boxes only. Looks like £60 BT fee and £20-26 month for fibre. Surely I shouldn't need to do that, though? If you have power line adapters, why are the consoles connecting via wifi? The main reason for using PL adapters is so that you get a wired Ethernet connection between two points in your house. Wireless connections will always be more laggy than wired ones because of the way wireless technology works. You can test if a wired connection improves things by temporarily moving the console with the issues next to the hub and use a short Ethernet cable to test. If it fixes the issue you could then invest in a longer wired connection to the back of the house, or just use the Ethernet connections on the PL adapters. @moorehypno A possible reason for one console having the lag over wifi and the other not, is because the original XBox One is the older wifi n standard, and the One S is the newer ac standard. Of course there is the usual interference, what band it's connected to and range factors.